Gas storage hot water systems are responsible for a quarter of Australia’s water heating needs. Their simple but reliable design are suited to a wide variety of applications including domestic, body corporate and commercial. Due to their impressive recovery rates, storage tanks are a great option for high demand hot water applications. Storage water heaters heat water via a thermostatically controlled gas burner. The ignition process uses a combination of a piezo igniter, pilot light and thermocouple flame failure device. High demand units are often fitted with electronic ignition and heat baffles to help save energy and reduce running costs. Due to the simplicity of the design, the hot water systems are both reliable and user friendly. – Locations without a power source. – Areas with low gas pressure. – Properties with undersized pipework. – Low flow rate applications. 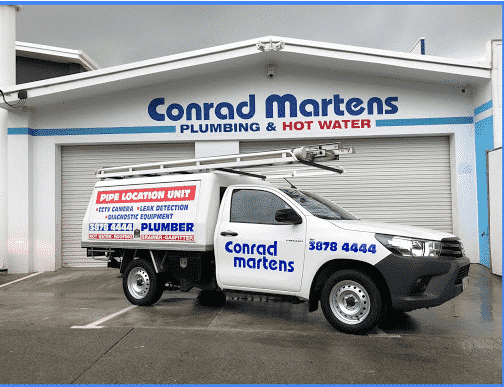 Here at Conrad Martens Plumbing & Hot Water, we have over 35 years experience as Brisbane hot water specialists. Our gasfitters and hot water technicians repair, service and install a wide range of water heaters. In our experience, the best domestic storage hot water heaters include the Rheem Stellar, Vulcan Freeloader and Dux Endurance. These units stand out as the most reliable, value for money storage heaters on the Australian market. – Natural gas or L.P.G. (propane). – To test supply pressure. – To test operational gas pressure. – To purge temperature pressure relief and cold water expansion valves. – To test operation of thermostat and gas valves. – To test piezo ignition. – To measure water flows. – To test for leaks. Due to a tightening of gas compliance requirements, many replacement installations now require relocation. A hot water system gas flue must be positioned outdoors and achieve minimum clearances from windows, doors and walls. On completion, a gas compliance plate and certificate must be issued. Form 4’s are another safeguard implemented by the Queensland state government to reduce the amount of incorrect installations. Hot water tanks must be installed on a solid, impervious base and be fitted with a compliant drain line. These installation requirements are subject to inspection and necessary to authorise manufactures warranty of a water heater. Storage gas hot water systems often have an adjustable thermostat. It is imperative that the temperature control device always remains above 60 degrees to prevent the growth of bacteria. In order to comply with Australian Standards, all bathrooms must be tempered to 50 degrees in order to prevent scalding. This can be achieved using a tempering or thermostatic mixing valve. Following a number of safety incidents with L.P.G. storage water heaters, a number of popular units have recently been recalled. These units include the Rheem Stellar and Aquamax 270. Unfortunately, this has created a void in efficient L.P.G. storage water heaters on the market. Relighting a hot water system can be carried out based on the manufacturer’s instructions. A detailed explanation can be inside the removal panel at the base of the unit. If the hot water system does not light according the the instructions provided contact a licenced gas fitter immediately. Never attempt to light a hot water system without referring to the manufacturer’s guidelines. For more information on Continuous flow hot water, or instant gas units please click here.